View from beach front balcony! This view from the private large balcony is simply amazing! Pool area beach side. Pool is heated in the winter! 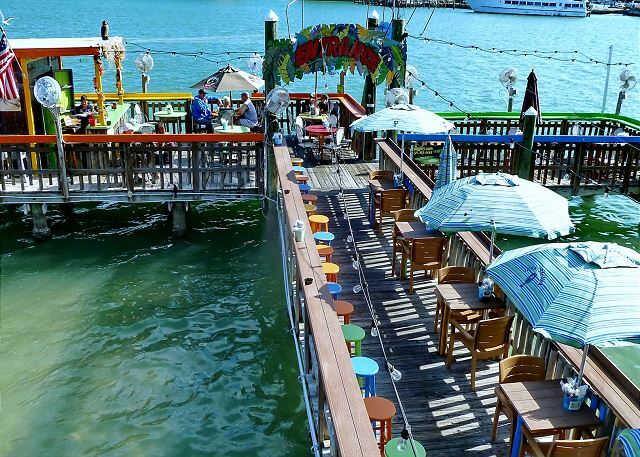 John's Pass - Eat, drink, shop! John's Pass less than a mile away. 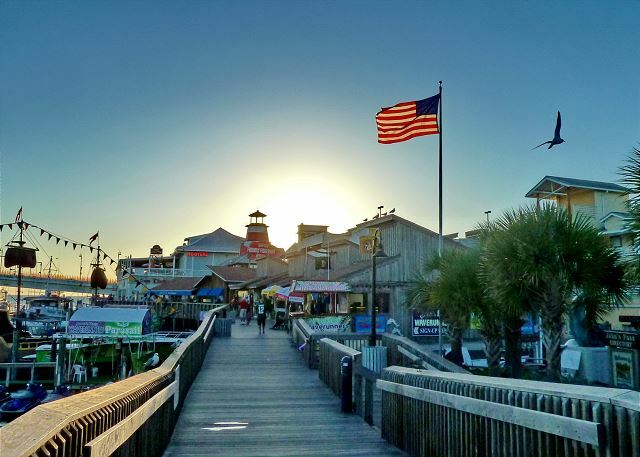 Restaurants, Shopping, Entertainment, Activities...great for all ages! Relax under the Tiki Beach side! Madeira Beach - white soft sandy beach! Can't get enough of these famous Florida sunsets! Cheerful colors and shiny tile welcome you to this vacation condo. The décor is tasteful and comfortable. Plus, the view from the large screened balcony is fantastic. The master bedroom has a door to the balcony too. This is a perfect place to relax and enjoy the Florida lifestyle. 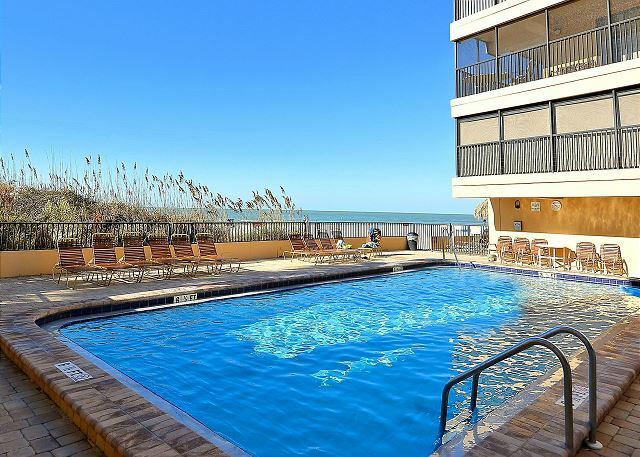 Plus, you are within walking distance to restaurants, shops and other beach activities. Free DSL internet service is available. Love the condo, the area, neighbors we’ve met, the beach, the rental company! Our stay at Villa Maderia #203. Was like a hand written ' what is your idea of a great vacation'. 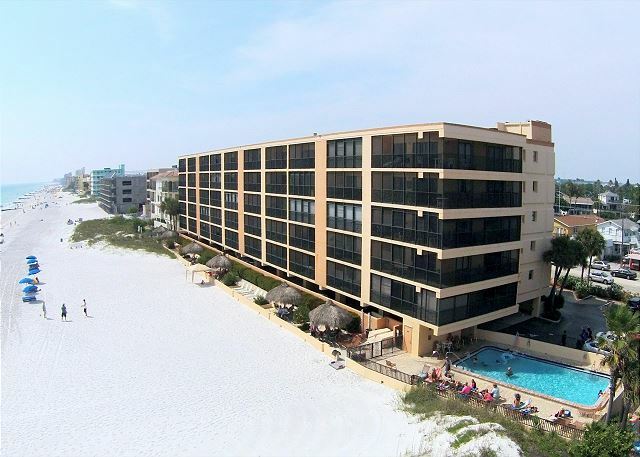 On a beautiful beach, new, clean, spacious condo with plenty of amenities....and that is exactly what we got !!! That is awesome, thank you for sharing!!! :-) We are so glad you were comfortable in this premier condo at Villa Madeira and had all that you needed for a great vacation. 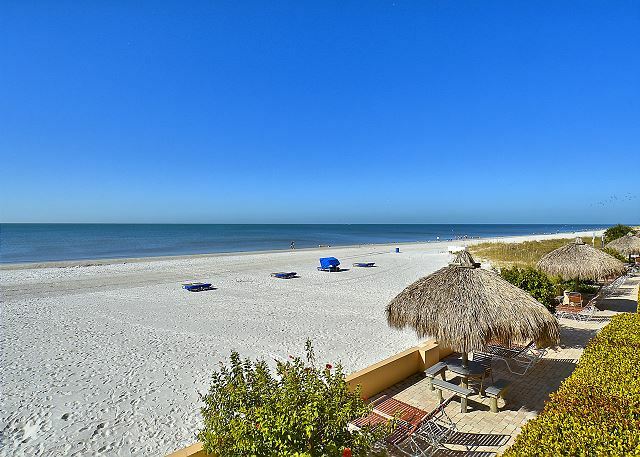 Thank you for choosing to stay with us and we hope to see you back for another visit to Madeira Beach in the future! Our family had a great time at Villa Madeira. We stayed 7 nights in Condo 203. The condo was very clean and spacious with an amazing view of the Gulf. We would definitely return to the Villa Maderia. The only down side was that you needed keys to access the stairwell elevator and pool. A keypad would be a much user friendly experience. We were given 2 sets of keys however with 3 adults and 2 teenagers more keys would be useful since you need keys to access most things. Great to hear you had a nice family getaway at Villa Madeira!! We are sorry for any frustrations the secured access may have caused you. Unfortunately the keyless entry is something that the condo association itself would need to put into place, in the meantime we need to do the actual keys. We will be sure to pass this feedback over to them. If we can help by providing you an additional set of keys during your stay, please don't hesitate to contact our office and we would be happy to help with that side of it. 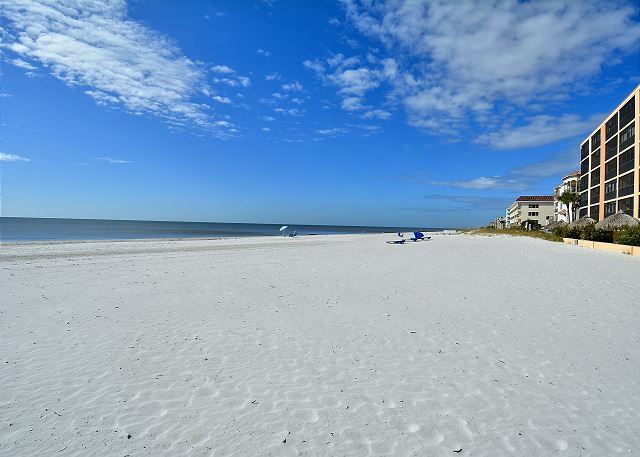 Thank you for being our guest and we hope to see you back on Madeira Beach for another visit soon. We love to hear it!!! :-) Thank you for being our guest in this premier condo at Villa Madeira and we hope to see you back again soon! The rental property is perfectly located and you cannot beat the Candy Kitchen across the street. We loved the screened in porch. The unit was nice needed some fixes, but overall nice. We loved that in the closet on the porch there is plenty of sand toys and water fun. We organized it for the next renters. Wifi could be updated, and the keys to get into and out of everything would be much better if it was a number lock instead. But very secure place and loved our vacation. We are so glad you loved your vacation, that is what we want to hear!!!! :-) Yes, having the keys needed for all entrance on and off of the property can get to be a bit much, but it is for security and so that others do not use the pool/restroom that are not staying. Key pads for entry would be nice and we have passed that along to the condo association that manages the grounds. We too would love to see this!!! Thank you so much for choosing to stay with us and we hope to have you back for another visit to Madeira Beach!! Enjoyed the updated kitchen, the lovely and bright main rooms and the wonderful view. That is so great to hear!! :-) We are so glad you enjoyed this premier unit at Villa Madeira and we look forward to your next visit! We had a great experience at Villa Madiera #203. The condo was even nicer in person than in the pictures. We had two small children and plenty of space. We enjoyed sitting on the screened-in balcony watching the water, and the kids enjoyed playing with the sand toys. Our only dislike was that the fire alarm system was bring replaced during our stay, which was an inconvenience. We are so happy to hear you had a great time in this premier condo at Villa Madeira!! We truly apologize about the fire alarm system work that was being done while you were here, unfortunately this was something that the building needed to do to be sure everyone was safe and up to code but we definitely understand the inconvenience during this time. The work is all complete so hopefully we will see you back at this property for a future visit! Great....love the amount of pots and pans. Was disappointed the Keurig coffee maker was broke but used the other one. Great beach front place for a family! We were very excited when we entered the condo for the first time! it has such a great view of the gulf, right out the living room and bedroom doors! perfect accomodations, well equipped condo with plenty of space for everyone. comfortable beds, bedding could use updating for sure. a few minor repairs around the place could be done. but overall we were very satisfied. Thank you for your post and feedback, we greatly appreciate this! 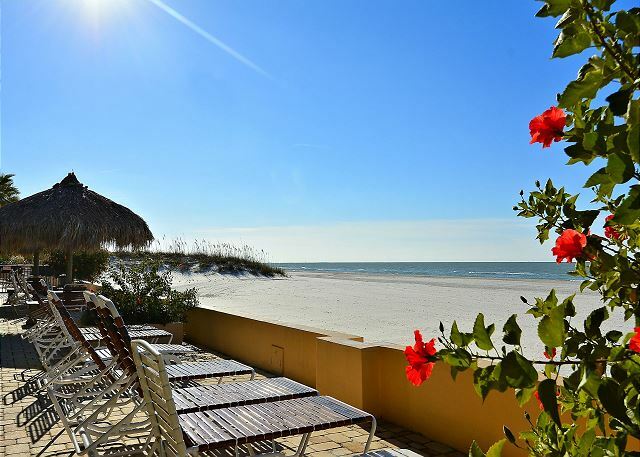 We are happy to see you enjoyed the views that this condo provides, Madeira Beach and the Gulf are just amazing and we are glad you appreciated that! :-) We will be sure to pass this over to the owner for their review in regards to the bedding and minor repairs that are needed, thanks for that! We are glad you had a good family vacation and hope to have you all back for another beach vacation in the future!! We always like staying at this building and the staff at Resort Rentals take good care by making sure the unit is well maintained. Always there to help. Thank you for the post and kind words!! We are always more than happy to help! :-) So glad you enjoy this premier condo at Villa Madeira and we look forward to your next visit with us! Very peaceful. Complex was a good size without a huge amount of condos. Beach was perfect. Condo was updated which made it more like home. Having a washer and dryer was a necessity. Overall would use again. So great to hear, thanks for the post! 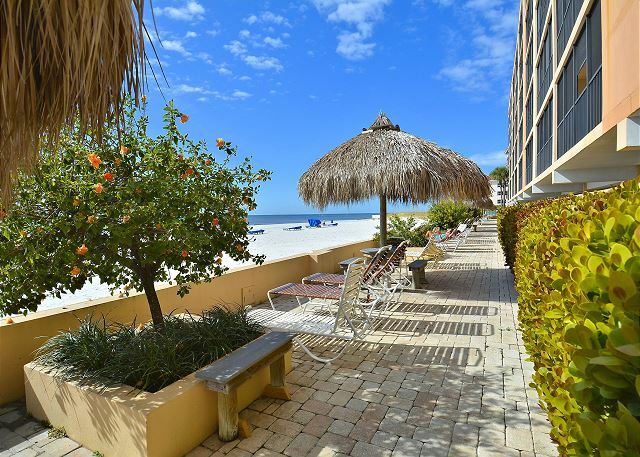 This location on Madeira Beach really is ideal and on a great, wide stretch of beach and we are so glad you enjoyed it as well as this premier condo there! 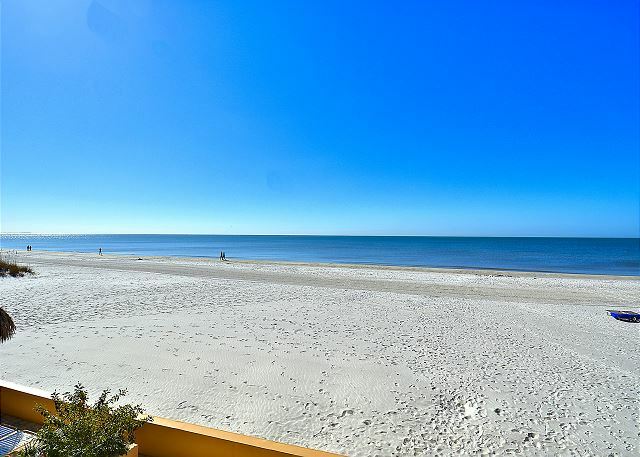 :-) Thank you so much for being our guest and we hope to have you back on Madeira Beach again soon! This condo is a beautiful, upgraded, and very clean unit, right on the beach, and close to many great restaurants and shops. It's also walking distance to John's Pass. We enjoyed the sunset from our balcony every evening. The beachfront was never crowded during our stay over April spring break, and we were usually able to get some shade under one of the tiki huts that are in front of the building by the beach. The only negative comments we have were that the rooms in the front of the building along the road can get a lot of noise from the street. The front door and walls must not be very soundproof. The other complaint is that for security, the condo provides keys to use to get to the beach and into the pool, and into the entrance stairways, which is great, except for 5 people to have only 2 keys requires a bit of planning. Even if a family member lets you into the pool area with a key, you also need a key to get out. A few times my teenage kids got locked into the pool area and had to ask someone to let them out! What often happened was that people would prop the pool and beachfront doors open, but then one of the condo owners was upset and yelled at the people who were doing the propping. They really need a better system -- perhaps a key code. So glad to hear you enjoyed this premier condo at the Villa Madeira! We can definitely appreciate the frustration with the keys being needed at this building, this is something that is set by the condo association and we too would love to see a keyless entry here! Unfortunately this is out of our hands as that is something that needs to be approved and done through the association. During your next visit if you need an extra set of keys, we are happy to accommodate that just let us know! :-) Thank you so much for staying with us and we hope to have you back on Madeira Beach again very soon! So glad you enjoyed!! 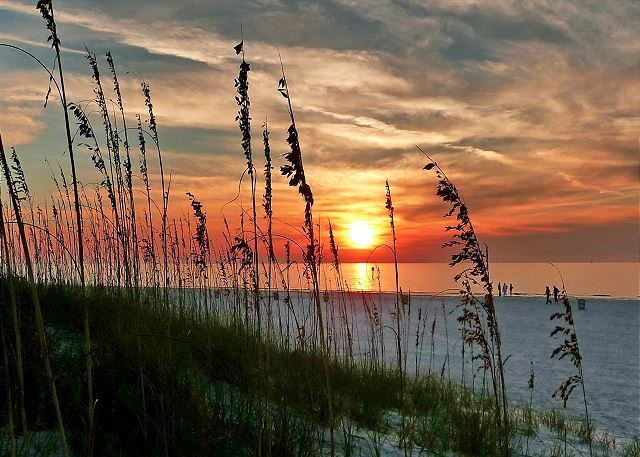 :-) We hope to have you back on Madeira Beach again soon! My husband and I haven't been to Madeira Beach for many years and it was just as beautiful as we remembered. The condo was very clean and just as nice as the pictures. There was only the 2 of us but we could have used more kitchen plates and then we could have used the dishwasher less. We had a wonderful 2 weeks vacation. The condo has a screen door so there was a wonderful breeze right through the condo so the air was hardly on at all, which was nice and the condo was cool. 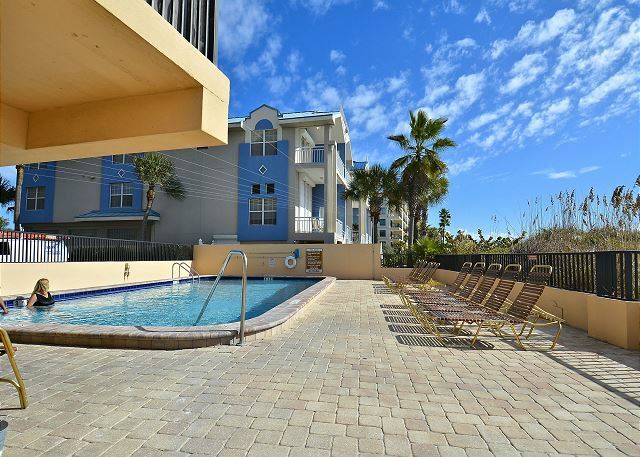 So glad to hear you enjoyed this Madeira Beach condo!!! :-) The beaches on Madeira Beach are just lovely and the weather this season was GREAT!!! If you are ever in need of any kitchen items, please do not hesitate to contact us at our office as we do keep many supplies here that we are happy to get your way. Thank you for being our guest and we look forward to your next stay with us!! We were not familiar with Madeira Beach at all. We had been to Florida numerous times but had never been anywhere near Madeira Beach. When we were looking for a winter escape a friend told us about a neighboring beach, and that's when we discovered Madeira Beach. We decided to take a chance on Madeira and boy, are we glad we did. We fell in love w/ Madeira and can't wait until we can come back. We found the laid back beach lifestyle we were looking for. Love, love, love it! This was the perfect location for Thanksgiving on the beach. 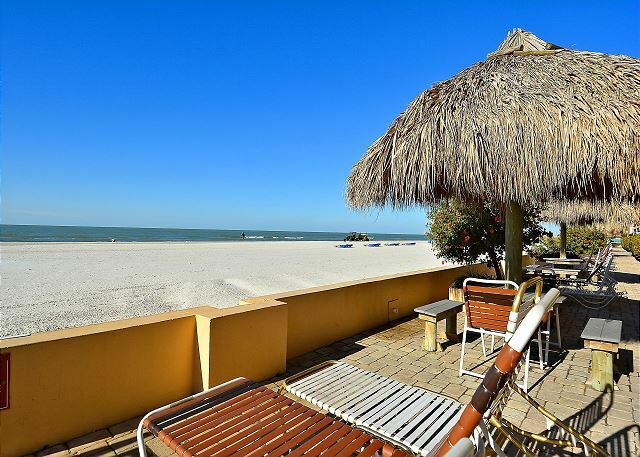 Thanks for the post and we are so glad you enjoyed this Madeira Beach location!! :-) Come back and visit us again soon! Early November stay. Very impressed with unit 203 and would stay again. Very clean and COMPLETELY updated and tasteful. Easy access to beach from 2nd floor using stairs. Clean exterior. Very easy access to John's Pass and you can walk there on the beach without crossing a pretty busy street. Washer and dryer in unit which included a small 3rd bedroom for bigger families. Overall we were satisfied with our vacation experience. The grounds were clean and well maintained. The beach was terrific and was groomed every day. The unit had some updates and we were generally satisfied with the condition. Here are a couple of things that kept me from rating it 5-star across the board: 1) The pillows were perhaps the cheapest I've ever laid my head on. So much so that after the first night I went and purchased two pillows. Hopefully the next vacationers appreciate that we left them:) 2) We thought the beds were super uncomfortable. I must submit the disclaimer that at home we sleep on an adjustable temper-pedic bed. Maybe we are just spoiled. If I owned the unit I would upgrade the matresses. Overall a good place to stay convenient to everything. Thank you so much for your post and feedback! We are thrilled to hear that you enjoyed the grounds and the beautiful beach location of the Villa Madeira, it really is a great location!!! :-) We do apologize if the bedding in this condo was not a good fit for you. We do understand that everyone’s preference in this area does differ but we also know how frustrating it can be as well! We do keep a supply of additional pillows here in our office and we are happy to supply you with new or additional pillows to replace what is currently there, so please do not hesitate to call us at our office with anything you may need!! We of course do not want you to feel you must go out and buy them while you are here! Also, we do have 2 different categories of condos in our program, standard and premier. The condo that you stayed in for this past visit was in our standard category but we do have a number of premier condos as well to choose from at the Villa Madeira. In a premier condo you will find recent updates to the kitchen and bathrooms along with newer flooring, furnishings, appliances and flat screen TV’s. Should you want to try something a bit more updated for your next visit, perhaps a premier condo could be a nice choice for you! Thank you again for being our guest and for choosing to stay at the Villa Madeira, we hope to see you back on our beautiful beaches again soon!! Our families have been taking beach vacations for over 10 years. We have traveled from Lake Michigan to Myrtle Beach, South Carolina, the outer banks of North Carolina and both Florida coasts. The group agreed that the stay at Villa Madeira ranks as one of the top vacations. Although some construction maintenance at the Villa was a little noisy, it was almost a perfect week. Loved how close we were to the water and the layout of pool. Great area for dinner activities. Thanks for the post and we are so happy to see where our area ranks with you!! Yay Madeira Beach!!! :-) We do apologize for the construction activity and noise during your stay, this is something that was already to be done and we are sorry for any inconvenience. We look forward to having you on our beaches again soon! We spent a week at the Villa Madeira #203 and had a great time. The unit was recently updated and well furnished. The beds were comfortable and having the washer and dryer was also a great bonus. We were disappointed that there was no area where you could grill out at the condo. The only complaint we have was the dirty dishes in the cabinets. Other than that the unit was very clean. We have friends in the area and when they came out everyone commented on how wonderful the unit was. My family and I have been coming to Villa Madeira for almost 20 years. Each time we come, the area is well taken care of, a beautiful well taken care of pool, and staff that totally blows us away. The particular condo this time (203) was especially gorgeous, with a spectacular ocean view. We are regulars!! Absoultely great place and gorgegous location. Was only disappointed with the fact that they had construction going on at the height of spring break. This is our second time staying in this unit. It was a little outdated but we were informed that we were the last renters before a complete remodel was being done. The Unit itself was very clean and the location is awesome! The third bedroom is on the small side, however that is not a problem since most of our time is spent at the heated pool or on the beach. The full size washer and dryer made our stay easier having all the comforts of home. You can't go wrong with this property and the price was awesome. Fantastic vacation with 2 young children. We love the short walk to the ocean and the uncrowded beach. The pool is never crowded. The unit is clean and well stocked. Bring your own beach towels. The outlets need replacements many times the wireless router became loose and we lost internet connection. Many outlets in the unit do not work. Enjoyed our stay. Condo was clean and great view of the beach. Condo kitchen does need to be updated. The property is an older property with furnishings to match. The rooms were clean, the beds were not real comfortable. We did not see any property management people the first 3 days Friday (night), Saturday and Sunday, but after that we did. The heat in the pool was not turned on until we talked to staff on Tuesday, after they turned on the heat the pool was good. The beach was great, loved the size and length for long walks. Thanks for your review. I appreciate you letting us know what you liked about your vacation as well as suggestions on what could be improved. I have passed on your comments to the appropriate departments. The pool heater actually was not functioning properly and once we were aware of the situation, the association had it quickly repaired. Thanks again for your review and we hope to see you again! Very clean and spacious condo with all that we needed for a fam of four (kids 8 + 11). Pool small but not overcrowded and beach wonderfull. Johns pass a bit over rated but ok. Only thing was the ice maker in fridge didnt work and in july/aug this would have been good. I called rental and i think they sent a plumber but we never heard anything. Thanks for your great review! Sorry the ice maker quit working while you were here but I am pleased to say it has been replaced and the ice is flowing!! Thanks again and we hope to see you again soon. Very relaxing vacation. The condo was clean and met our needs. Bring your own beach towels they were the only item we lacked. Even though it was the Fourth of July the pool and beach was uncrowded. We would recommend this to families. Fantastic fireworks all the way down the beach! This was our third time staying at Villa Madeira, a family of 4, and each time we've stayed in a different unit. This one was great. The patio and indoor furniture and beds were really comfortable and there were tons of beach toys. There were even some books and puzzles in the unit. The shower in the master bath was a bit odd (my 3-year old thought it was a pool) and dark, but it worked for us. We would stay in this unit again. A lovely location in a clean and friendly atmosphere. Pool for kids and straight on to a magnificent beach. The apartment was great and good facilities in general. Two comments for improvement: we found a limited amount of cups, plates, knives and forks, just enough to cater for four and then a machine would need to be put on. The other point sounds stupid but was quite bothering. The mattress cover which had a plastic coating underneath kept popping off the mattress which meant that each time you move in the bed you found yourself stuck to a plastic part of the sheeting. A detail but important nonetheless. We suggest sheets which do not pop off the mattress. Otherwise no other criticism. The rest was clean, friendly and very relaxing. Thanks to resort rentals for their professionalism. Thanks for your suggestions. Sorry about the limited kitchenware. Next time, if you are missing any required items in your condo just let us know. We have most of the basic items in our office and have no problem revisiting a property to make things right! Nice area and beach. Condo is clean and comfortable. Weather was not so great in Feb 2014, but still enjoyable. Very nice experience! We really enjoyed our time there and will consider this rental again in the future. i had a nice relaxing time . i would recommend it. The location is perfect. LIterally steps from the beach. Five friends turning 40 and we couldn't have asked for a better vacation. Close to Johns Pass where you can shop and eat. Lisas Cafe is a great place to eat! We would definitely go back! Great location, beach is gorgeous. Lots for teenage children to do with shopping/activities within walking distance. Great central location. Lots of great places to eat. A wonderful experience for my family. The view was breathtaking and the location was excellent. As a first time renter of a place in Florida, I could not have asked for a better time. Unit could use some updates, but it was clean and had everything that we needed. Will definitely go back. Had a wonderful time and will most definately be returning. This was our 5th time visiting the area for Thanksgiving and we really enjoyed Villa Madeira. The weather was perfect but the beach was a little too windy for sunning so the lounge chairs located behind the short sea wall was perfect. The condo was exactly as the internet pictures showed. Very nice place to stay and the view of the Gulf was awesome! We were excited to see dolphins swimming right off the beach. Great location near St. John's Pass with lots of attractions and things to do. Villa Madeira will be the place we stay next time we vacation in Florida. Love Maderia beach and would come back again. we had a great time, only thing was the seaweed on the beach. there was alot of it, but the pool was nice and clean and the room was fantastic. not sure why there was screening around the balcony, stopped the breeze from coming in, needs an overhead fan, otherwize the condo was very nice and well equipped. A little outdated in decor and amenities. Met our needs. Thanks so much for your review. I will pass on your comments to the owners. We appreciate your feedback! Right on the beach, close to everything you may need to get to. Easy drive back to Tampa Bay.Clean secure building. Highly recommended. The condo was nice, clean, and great view and access to the beautiful beach. Our only wish was that the master bedroom tv could have had a dvd player.